One new venue at the Fort Lauderdale International Boat Show is a “village” unto itself: the 228-foot megayacht SeaFair. Launched in 2007, the $40 million yacht was built as a traveling showroom of fine art, jewelry and collectibles paired with water-view fine dining. 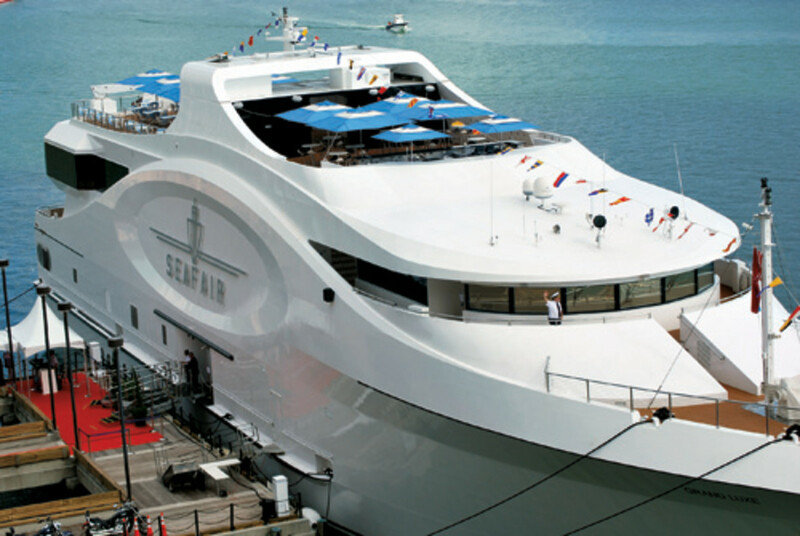 At the show, SeaFair will be positioned on the outer docks of the Bahia Mar Yachting Center next to the Superyacht Experience, serving as The Club at SeaFair, the VIP venue for Yachts International magazine. Access is by invitation, but SeaFair is open to the public on a space-available basis. There is no admission charge. During the show the lower two decks will remain a showcase of international fine art, jewelry, interior design accessories, luxury travel and real estate set in a club-like atmosphere, including a coffee bar and open-air lounge. The third deck features more exhibition space and a formal glass-walled restaurant. The fourth deck features an informal open-air restaurant and cocktail reception area. The top two decks are reserved for superyacht owners, builders, designers, naval architects, brokers and guests. Private receptions, parties and meetings will be held there throughout the show. The VIP venue is the result of a partnership among the yacht’s owners and Active Interest Media, the AIM Marine Group and Show Management — the organizers of the boat show. Under the partnership, The Club at SeaFair also will be showcased at other Show Management-produced events: the Yacht & Brokerage Show in Miami Beach in February and the Palm Beach International Boat Show in March. SeaFair is the brainchild of principal owners David and Lee Ann Lester, who have organized international art fairs around the world through their firm, International Fine Art Expositions. The Lesters were innovators, bringing fine art to buyers by hosting temporary galleries in art hot spots under a canopy of tents. “This was unheard of at the time — million-dollar art under tents. I’m known as the P.T. Barnum of art fairs,” David Lester says.